Objective(s): Primary hyperparathyroidism (PH) is characterized by a high level of blood PTH and calcium. Case: A 23-year-old male patient with no previous history of any chronic disease was referred to the urology polyclinic of the hospital due to renal colic. On the direct urinary system chart and in the urinary system ultrasonography, left ureter calculi and grade-2 hydronephrosis were detected in the left kidney. The patient's serum calcium and ionized parathyroid tests were determined to be high and he was consulted to an internist with a prediagnosis of primary hyperparathyroidism. Thyroid / Parathyroid Ultrasonography showed a 12 * 13 * 23-millimeter size, well-defined hypoechoic, slightly heterogeneous solid lesion in the left parathyroid root. 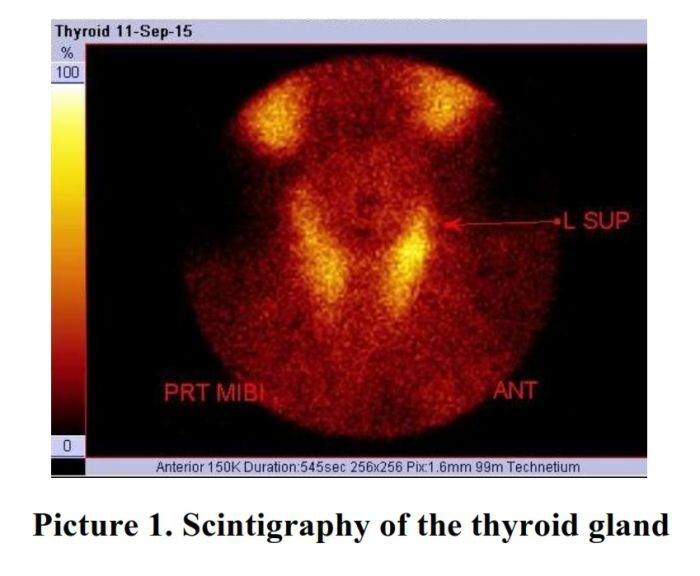 Parathyroid scintigraphy sestamibi technetium-99 detected a parathyroid adenoma/hyperplasia in the posterior vicinity of the middle part of the left lobe of the thyroid. Discussion: In a young patient, a neck mass usually originates from a congenital disease or due to acute infection. Parathyroid tumors are rare causes of neck masses at young ages. However, physicians should pay attention to additional findings associated with conditions that may be more serious than the presenting symptoms. In this case, it was a parathyroid tumor diagnosed by careful physical examination of a patient with renal colic. Hastalığı olmayan 23 yaşındaki erkek hasta renal kolik nedeniyle hastanenin üroloji polikliniğine başvurdu. Hastada serum kalsiyum ve iyonize parathormon sonuçları yüksekti ve hasta bu sonuçlarla primer hiperparatiroidizm ön tanısı ile iç hastalıkları uzmanına konsülte edildi. Hastanın Tiroid / Paratiroid Ultrasonografi incelemesinde: sol paratiroid kökünde 12 * 13 * 23 milimetre boyutlarında, iyi tanımlanmış, hipoekoik, hafif heterojen solid lezyona rastlandı. Paratiroid sintigrafi sestamibi teknisyum-99 incelemesinde tiroidin sol lobu orta kısım arka komşuluğunda bir paratiroid adenomu/hiperplazisi tespit edildi. Tartışma: Aile hekimleri günlük pratiklerine boyun kitleleri ile sıklıkla karşılaşırlar. Genç erişkinlerde boyun kitlelerinin en sık nedenleri konjenital hastalıklar veya enfeksiyonlardır. Paratiroid patolojileri boyun kitleleri genç yaşta nadirdir. Sonuç: Genç bir hastada, boyun kitlesi bir konjenital hastalık veya akut bir enfeksiyona bağlıdır. Bununla beraber, hekimler hastanın mevcut semptomlarından çok daha ciddi durumların işareti olan bulgulara dikkat etmelidir. Bu vakada renal kolik şikayeti ile başvuran bir hastada dikkatli bir muayene ile ortaya konulan bir paratiroid adenomu sunulmuştur. A 23-year-old male patient with no previous history of any chronic disease was referred to the urology polyclinic of the hospital due to renal colic. On the direct urinary system chart and in the urinary system ultrasonography, left ureter calculi and grade-2 hydronephrosis were detected in the left kidney. Urinary computed tomography showed proximal ureter dilatation with grade-2 hydronephrosis in the left kidney and a 7 millimeter (mm) calculus in the lower end of the ureter. The urologist recommended the use of medication to pass the renal calculus and urine ultrasonography to follow hydronephrosis. When the patient's serum calcium and ionized parathormone (iPTH) tests were determined to be high in the blood tests required by preoperative anesthesia, the patient was admitted to the internal medicine service with a prediagnosis of primary hyperparathyroidism and parathyroid adenoma. There were no features in his history. His father and aunt had a history of renal calculi. He did not have any history of addiction. On physical examination of the patient, his general condition was good, he was conscious, oriented and cooperated. Body temperature: 36.2 ºC, pulse: 70 / minute / rhythm, respiration: 14 / minute, blood pressure: 130 / 70 mmHg. On neck examination, a painless, moderately hard nodule was palpated in the upper left thyroid loin about 2x1 cm. The left side of the costovertebral angle was sensitive to percussion. Other system examinations were normal. Blood sugar, transaminase values, thyroid function tests, hemogram, coagulation parameters and lipid levels were normal and hepatitis markers were negative. 10-15 erythrocytes were detected in sediment in urine specimens. Urine culture was negative. 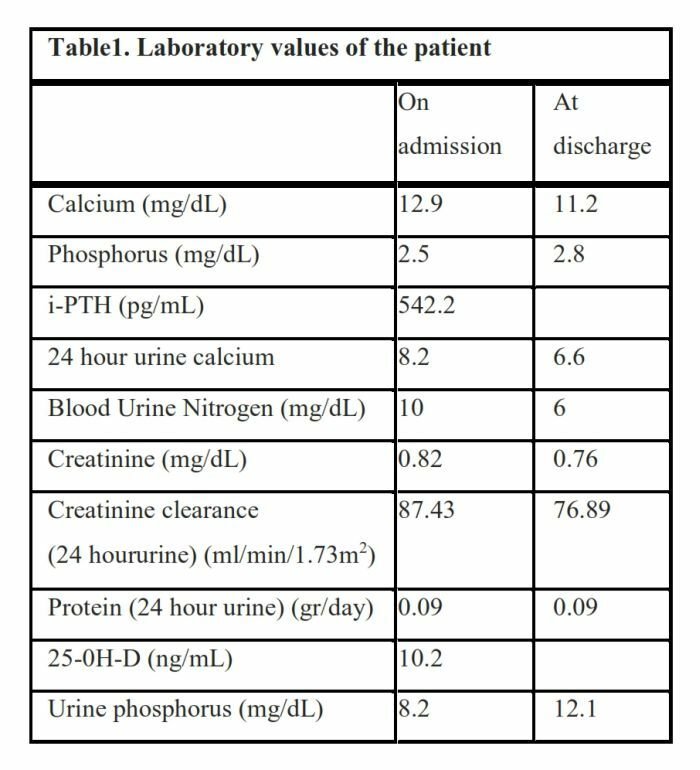 The laboratory values on admission and at the time of discharge of the case are shown in Table1. Thyroid / Parathyroid Ultrasonography: A 12 * 13 * 23 mm size, well-defined hypoechoic, the slightly heterogeneous solid lesion was found in the left parathyroid root. Parathyroid scintigraphy (sestamibi Tc-99): parathyroid adenoma/hyperplasia were detected in the posterior vicinity of the middle part of the left lobe of the thyroid gland (Picture 1). Bone density, dual-energy x-ray absorptiometry (DEXA) showed femur osteopenia. He was consulted with a general surgeon but he refused any further investigation. In the present case, the patient was a 23-year-old man admitted to the urology clinic with complaints of costovertebral angle tenderness. He was subsequently diagnosed as having a parathyroid tumor. Similarly, in a case report in 2013, parathyroid carcinoma was considered to be pre-diagnosed because of bone / joint complaints, hypertension and hypercalcemia in the laboratory results of a 65-year-old woman. As a result of the investigations, it was understood that the patient had the parathyroid adenoma.2 Benign or malignant neoplasms are more likely to be diagnosed in older adults.3Malignancy in an older patient can be more easily recognized, whereas in the present case the patient was young. Primary hyperparathyroidism is associated with a significantly elevated PTH concentration and hypercalcemia. The most likely diagnosis in patients with low creatinine clearance is primary hyperparathyroidism. Although a gold-standard modality is required, early experience with parathyroid scintigraphy may indicate parathyroid adenoma. 4In our case, iPTH, and calcium levels were high, creatinine clearance was low and parathyroid scintigraphy was suggestive of an adenoma. In a young patient, neck mass rarely originates for chronic reasons. In a holistic approach, family physicians should pay attention to additional findings presented by patients. For example, a palpable neck mass can be diagnosed as a parathyroid tumor with the help of concomitant hypercalcemia and nephrolithiasis. Arend WP, Armitage JO, Clemmons DR, Drazen JM, Griggs RC, Larusso N. Cecil Medicine: Expert Consult Premium Edition - Enhanced Online Features and Print 2008;23;1900-1901. Schwetschenau E, Kelley DJ, The adult neck mass. American Family Physician. 2002;66(5):831-839.